We design new sites and make old sites look like new. Let’s work together to create a modern, fresh image for your business. It can all happen faster than you think. Give us a call to learn more. We’ve created thousands of products for online stores over the years. Every ecommerce website we design is responsive to all screen sizes and works perfectly on mobile devices. Need help creating your monthly e-newsletter or sales flyer? Maybe your business cards need a little updating. Whatever it is, keep us in mind. You’ll aleady know the quality of work to expect. Always getting writer’s block? Whether you don’t have the time or simply have better things to do, we can do the thinking for you. Our background covers digital media, newspaper, magazines and radio. It is more likely a someone will visit your website before ever walking in the doors of your business. Expectations are bigger than ever when it comes to your online presence. This is what we do best. Being mobile-friendly is no longer an option, it's a requirement. User experience and design will decide how long someone will be engaged on your site. Want to see more of our work? Click the link below to view our portfolio. We take the extra time to design multiple layouts for each banner. This allows us to move and adjust the elements so every banner looks custom made for every screen size. Wordpress is a content management system (CMS) that has leveled the playing field for small businesses trying to compete with larger companies with endless marketing budgets. It allows us to create awesome websites that you or your staff can eventually learn to edit! The WordPress community has endless resources that allow endless possibilities when building your new site. We operate on caffeine and creativity. Get us the info and pictures we request and your site will be ready in no time! If you don’t have the drive to gather up photos or write up the body text we can do it for you. Luckily for you, we think sleeping is overrated. Your business is our business. We immerse ourselves in the industry and review your competitors’ websites. Its easier to see what others do right and change what they do wrong. Everything from branding, photos and text font is chosen for one specific reason, to engage your customer. As part of our services, we include a Search Engine Optimization tool that allows us to add keywords and edit how your website and page descriptions will appear in a Google search. There’s no reason to invest time and money in your site and then not be found in a local search. First impressions mean a lot. No one talks about second impressions. Our websites give your business a fresh new look. A chance to brand yourself and reach out to new customers that match your vibe. We don’t believe in “sink or swim.” We teach you to swim so you don’t sink. Every website is paired with a 1-2 hour training session. We keep it easy for you. Push these buttons. Don’t push anything else. Edit this section. Hit save. There’s more to it, but you get the idea. Simple text and image changes can be done by you or your staff. Not your thing? Ask us how we can help maintain your site throughout the year. Anything new can be overwhelming. It has taken a long time to learn the ins-and-outs of websites. We are here to answer any questions you have as you first get started. We also show you additional learning resources. Some of our clients learn the bare essentials, others have someone on staff take charge, while most of our clients simply contact us to make any changes or edits. Either way, we’re here to help! 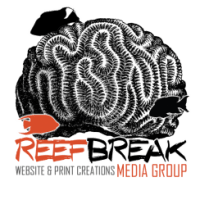 My name is Peter and I’m the owner and Creative Director at Reef Break. My wife and I also run FreeRide Surf and Skate Shop in Gainesville, FL. I know what its like to have a retail shop with overhead and the evil of having to price match an online store on the other side of the country to save a sale. The ups and downs of small business continue to be a part of my daily life so I get it…believe me, I get it. Before retail, I was immersed for nearly 15 years in radio, newspaper and magazine publications helping businesses create clever ads that worked. I’ve won multiple awards on regional and national levels using ideas that grab people’s attention whether it’s serious or hilarious. For me, working on websites are a culmination of everything I enjoy doing in advertising and marketing. A mix of all media. It’s also the first time I can help small businesses compete at the same level as larger companies with huge marketing budgets. It’s a struggle to prove how other forms of advertising perform, but you can be reassured that a well designed website is always working for you. Your website is more than just a one day ad in the newspaper or a 30 second ad on the radio. It is literally your store front to customers visiting for the first time. This is your first impression. This is a future sale or a potential lost customer. Let’s do it right this time. Let’s collaborate together from the ground up and create that first impression together. Need a quote? Want to run some ideas by us? Send us a message today and let's talk. because every business has its own vibe. All design and content Copyright 2019 REEF BREAK MEDIA GROUP. All rights reserved.